Learning to be content is a heart choice-a choice to pray rather than be anxious. When confronted with negative circumstances we have a choice: will we pray about the problem or will we worry about it? Too often in our lives, accomplishment and doing overshadow growth and becoming. *Taken from the book: Calm My Anxious Heart, A Woman’s Guide to Finding Contentment by Linda Dillow. 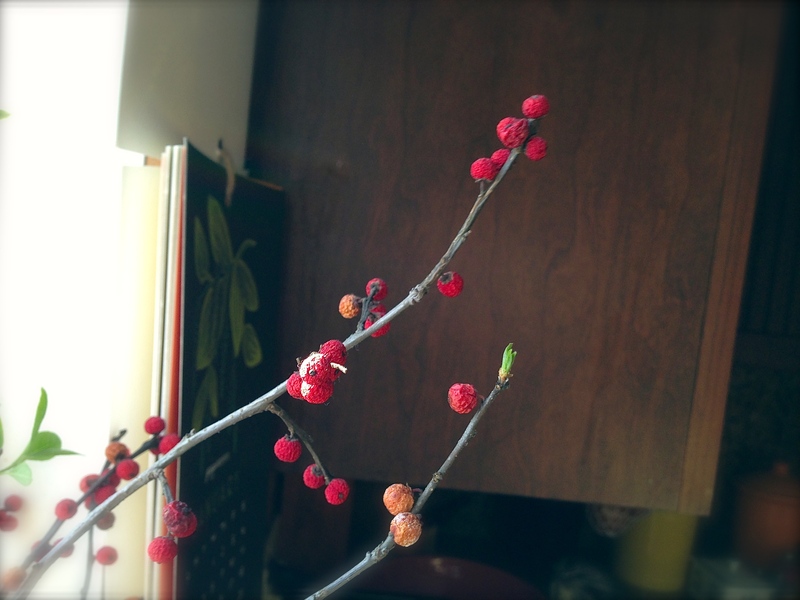 About the pictures: Before Christmas, I was walking outside and decided to cut a bouquet of winterberry branches for the kitchen windowsill. 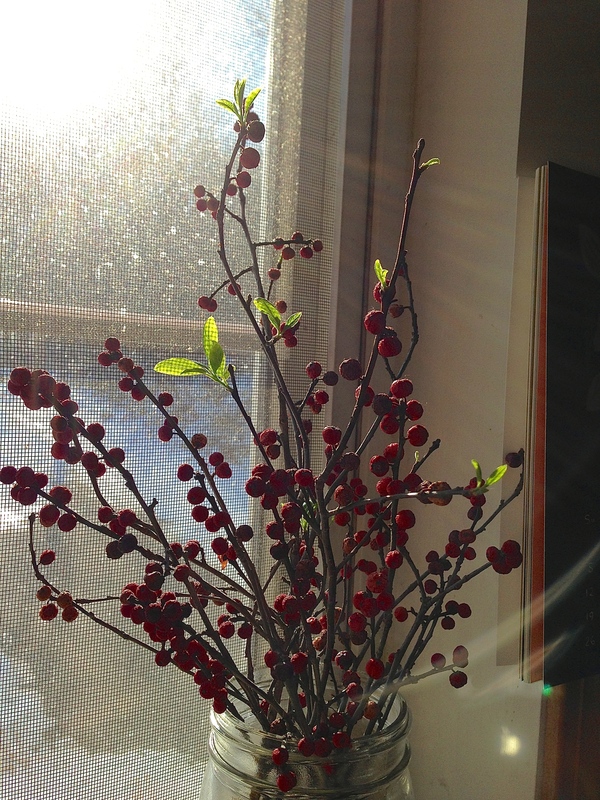 The branches were covered in bright red berries, and a favorite way of mine to bring nature into the winter house to decorate. 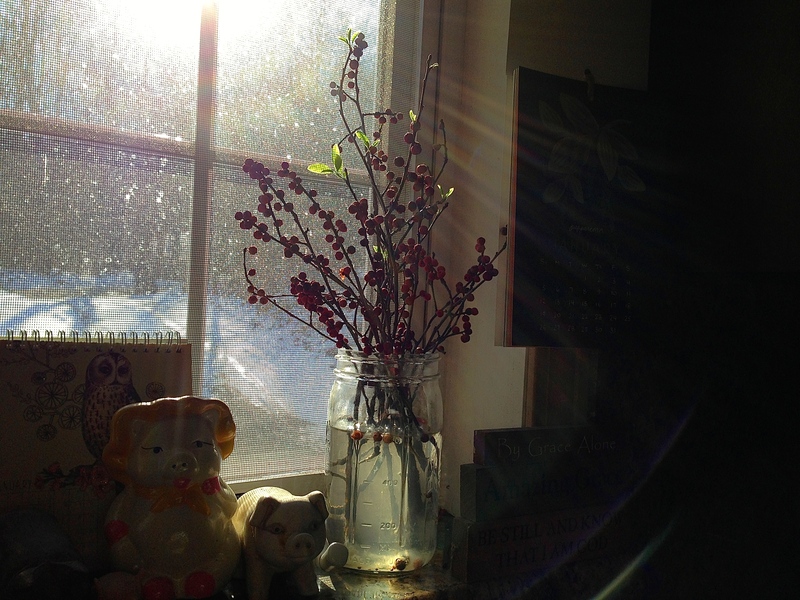 There they sat, and sat, and sat upon the window, for over a month. After a time, the water turned moldy, every time I bumped into it a shriveled berry fell, and there were little wisps of cobwebs growing, too. I distinctly remember thinking, “It’s about time I take that jar out to the porch and dump it over the railing.” But, of course it didn’t happen. Last week, on a particular bluesy-blue day, I was standing at the sink drying tears off my face and getting a glass of water. With a startle, I noticed that the dead and shriveled branches had a surprise in store for me. They were growing, with tiny, gloriously green leaves popping out, almost like magic. I almost didn’t believe my eyes. It wasn’t magic though, it was God showing me truth through his creation: He makes things new. He makes things grow. He makes beautiful things, out of dust. This entry was posted in faith, it's the little things, nature, the blues by Shanda. Bookmark the permalink. So beautiful! Thankyou for the beauty here today. Its a fresh reminder, and an encouraging word. 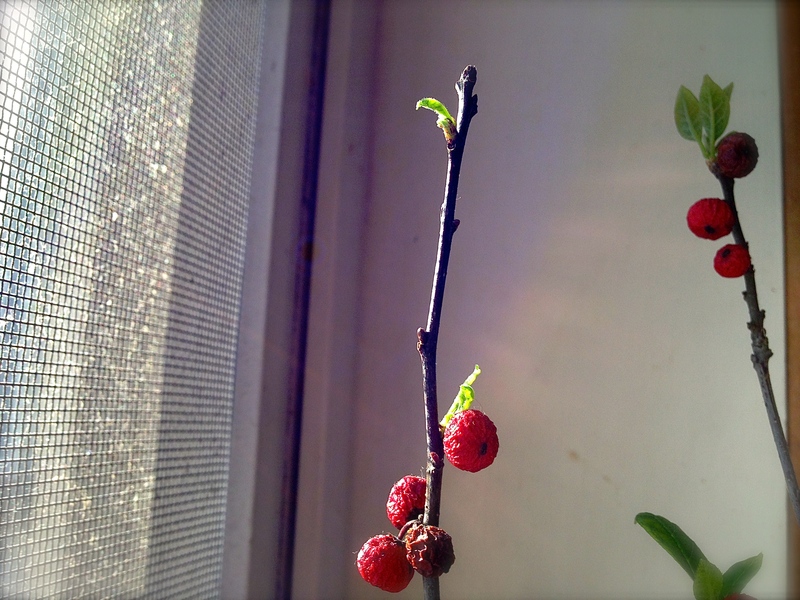 Im so very glad your dead berries turned into something beautiful. Im so glad you didnt throw them away and give up on them. Thankyou for sharing them with us. This post brought tears to my eyes. What a beautiful story about the Winterberries, and God’s message through them. I love how you captured them with your camera. Your creativity is boundless. I’m in awe sometimes. No, seriously…really…I’m in awe. I can’t tell you how glad I am that you are getting something out of that book. I appreciate your notes. It’s interesting to see what you found interesting in the book. I, too, wrote down that prayer about ‘Don’t let my pain be wasted…” I try to pray it every day, because it really hit home with me. That title caught my attention, and I had to go look through my bookcase. Sure enough, that’s the same book that our ladies Sunday School class was going through a number of years ago when Steve had a bad knee infection that landed him in the hospital and caused some very anxious moments for me! I love that first quote. I pray you are well and that you have a lovely relaxing Thursday and weekend following. Isn’t our God awesome?!? I just always pray that I will have eyes to see the gifts He brings everyday! It’s so easy these days to let the “busy”ness of life keep us from really seeing the things He brings our way! Thank you for always reminding me to slow down and enjoy! A timely post Shanda. Thanks for sharing. Things are looking like the rotting berries, dropping off. Maybe there’s new growth around the corner. i really loved this post, shanda! what a cool thing with the berries. only God does stuff like that. Love the red berries story. Also love the Gungor song. That song was a heart-cry song for me a year or so ago and I just ached with the praying of it in song. I really needed to read this. Perfect timing for my discontent heart. It’s true…When faced with negative circumstances we have a choice to worry or pray. Far too often I choose to worry. Very encouraging post. Thank you for sharing. I am tempted to order the book right now…hmm. The berries! How exciting to find new growth.